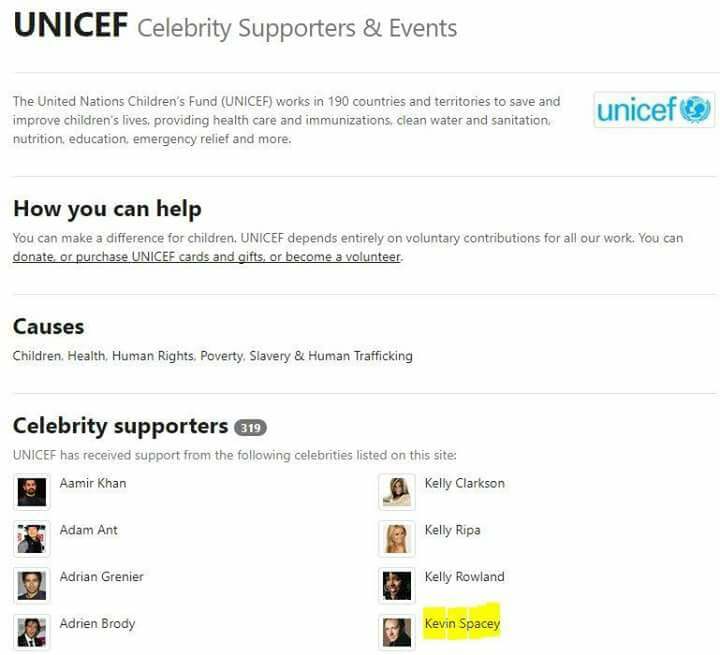 Kevin Spacey UNICEF “Celebrity supporter”. Screenshot from ‘.org’ website called “Look to the Stars”. Not only has UNICEF not commented on allegations regarding Kevin Spacey, or any other Hollywood celebrity’s, predatory and manipulative sexual advances on minors, it has not dissociated from Kevin Spacey who has been featured on a number of projects bearing UNICEF’s name, and is listed on a number of websites carrying UNICEF’s logo as a “celebrity supporter” of UNICEF (see Kevin Spacey on Time to Reflect Project organised by a well-known photographer apparently at UNICEF’s request and Turn on Taps Project organised by the ‘US Fund for UNICEF’). Kevin Spacey has been accused of sexually assaulting a 14 year old male actor to which Spacey has responded saying he may have committed some such act in a state of inebriation though he cannot remember. Since the scandal erupted earlier this week, other men and women have come forward alleging lewd and drunken behaviour by Spacey to both adult and underage persons showing him, if the accusations are true, to have been a far from wholesome model for children to have been celebrated or in any way associated with UNICEF, which draws millions in donations every year in the name of children, and which has been running massive international anti-child abuse campaigns in recent years. A dotcom website called “Who Say” features what appears to be a promo with UNICEF’s name and “Tap Project” on it saying “OPEN YOUR TAP NOW” with Kevin Spacey’s photograph. Another children’s NGO supported by Kevin Spacey as listed on “Look to the Stars” website is the UK based Small Steps Project. Kevin Spacey’s alleged conduct appears to be an all too familiar pattern of behaviour among Hollywood stars. The well-known UK publication, the Guardian has reported “Hollywood has a ‘rampant’ and ‘pervasive’ problem of men sexually abusing boys and young men, according to actors and lawyers who are speaking up about misconduct and harassment in the wake of an allegation against actor Kevin Spacey”. UNICEF and Save the Children have spent the large part of the 2000s in India and other developing nations accusing parents, especially in impoverished families, of being “abusive” and “neglectful” for such things as slapping and comparison with siblings. We would like to know why these organisations are not challenging the much more serious and severe exploitation of children and young people in Hollywood, especially when such serious allegations have been made. We would also like to know if celebrity stars used by UNICEF and other children’s organisations are at all vetted for allegations of sexual assault, drug abuse and alcohol abuse. Allegations about Kevin Spacey are not recent, and a cursory Google search would reveal rumours and speculations about Kevin’s Spacey’s inappropriate behaviour as far back as 2004 and 2007. While we are aware that celebrities come in for a lot of fabricated gossip and other misrepresentation, we would like to be assured that when such allegations are in the public domain, that UNICEF and other children’s organisations using their name or otherwise associating with them conduct some form of due diligence to ascertain their appropriateness for any association with children. 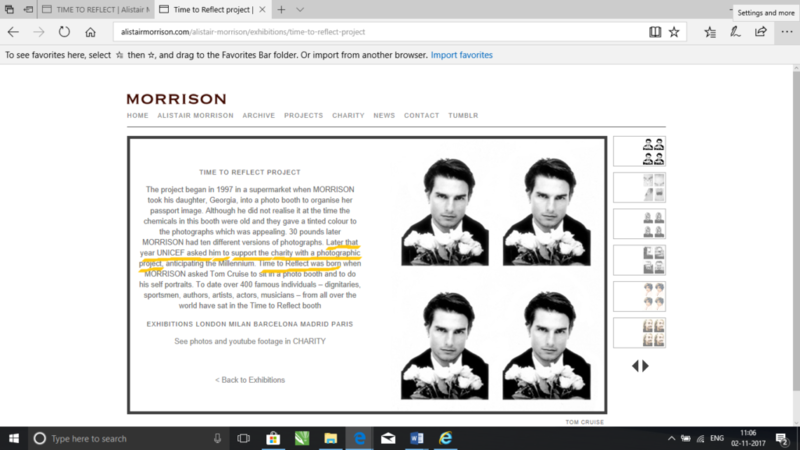 Screenshot from http://alistairmorrison.com/alistair-morrison/exhibitions/time-to-reflect-project/. UNICEF outsources fund raising. Does this allow unvetted celerities to be associated with its name? It appears that the modus operandi for UNICEF is simply to leave it to other parties such as the photographer who organised the Time to Reflect project and the US Fund for UNICEF which organised the Taps Project, to enlist any celebrity in such projects, allowing free use of UNICEF’s name and goodwill by these celebrities. It is a shame and a real let down of children that we allow suspected pederasts to be advertising in their name and, for all we know, using the public association of their name with “good works” for children in allowing them access to children to prey upon. In the case of Kevin Spacey, UNICEF must atleast be aware that as Art Director for many years at the Old Vic Theatre in England, he would have been in the way of countless children and teenagers brought to the theatre by unsuspecting parents for what ought to be a wholesome and educational experience for young people. Others have criticised The Old Vic for turning a blind eye to Spacey’s alleged misbehaviour there, but there has been no comment from UNICEF.